The wetlands in Huntington Beach, Calif. -- officially called Bolsa Chica Ecological Reserve and located next to Pacific Coast Highway and Bolsa Chica State Beach -- draw birds and birders from around the country. I know birders from New York who gladly will spend hours at Bolsa Chica, which hosts nesting, endangered Least Terns among many other species. Valued at $10, the calendars were produced by Bolsa Chica Land Trust, and one calendar can be yours for describing, in 300 words, your best bird sighting at Bolsa Chica. Send your entry to wildbird AT bowtieinc.com, or post it here in the comments for everyone to enjoy! The deadline is Sunday, May 3, and the winner will be announced on Monday the 4th. Are birdwatchers truly different than other hobbyists, always sharing details of birds' locations? Do all birders help strangers while participating in this avian scavenger hunt? 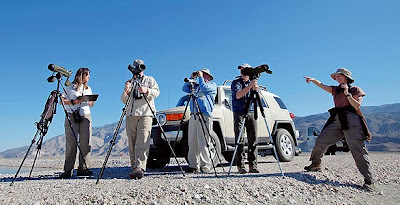 How often have you encountered reticent birders? Birders themselves are a very special breed. We would sidle up to a couple of obvious birding experience (judging by clothes and equipment), and ask a simple question: "What do you see?" A quick answer, tossed our way in a excited whisper, often led to an invitation to see the bird through their much-better binoculars and the opening of a bird book for a lengthy discussion about the bird's attributes, its plumage, where it wintered, the amazing journey it was now on and how to distinguish it from similar birds. Many of these birds are migrating north now and the Texas coast is their first rest stop after a long flight over the Gulf of Mexico. I thought about how different birders are from anglers. An angler wouldn't share a hot fishing tip or spot with his or her mother. Birders will tell you everything, eagerly. Birding, apparently, is a team sport. Animal Fund announced the launch of OdyseeTV, an online-only television station that focuses on conservation organizations and individuals around the world. Among the station's many 10-minute programs are six that focus on birds: "The Eagle Has Landed" (birds of prey), "Stand Vigilant" (cranes), "Losing Ground" (Burrowing Owls), "A Penguin Project" (Falkland Islands penguins), "Pirating the Parrots" (wild parrots) and "Los Farralones" (Point Reyes Bird Observatory). I would've liked to see a bird in that nameplate (above). What about you? The Federal Aviation Administration opened a database of bird strike records yesterday. Will the data spur more innovation and efforts to reduce bird populations near airports? Nationwide, there were 98,328 reports of aircraft striking birds or other wildlife since January of 1990, although the actual numbers probably are far higher. The Federal Aviation Administration said only 20 percent of incidents are reported under the voluntary system of data collection. 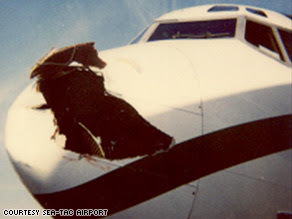 The database shows strikes resulted in "substantial damage" to aircraft on about 3,000 occasions. Eleven people died in incidents relating to bird strikes. The FAA initially fought to keep its database closed, saying publication of the details might discourage the industry from reporting information. After it was made public, an airline industry organization was quick to say the data could wrongly lead some people to believe flying is unsafe. Do you use one of the 10 airports that reported the highest number of strikes in the last 19 years? Perhaps some birders and ornithologists fall into the group of independent researchers, cited below, that wants to look at all available data. After getting pelted by criticism from everyone from airline passengers to federal accident investigators, the Federal Aviation Administration on Wednesday reversed course and said it will publicly reveal its records on bird strikes. The FAA said it will make its entire bird-strike database available on a public Web site on Friday, and is withdrawing a proposal to keep certain data confidential. The FAA had argued that protecting certain information, such as the names of airlines and airports involved in bird mishaps, would encourage airlines to participate in the voluntary reporting program. But critics, including the National Transportation Safety Board, said the FAA's secrecy was misguided. In a letter Wednesday, the NTSB said it strongly disagreed with the plan to restrict public access to the data. "The board believes that withholding such information ... would deny independent researchers the ability to examine all available factors in the database and would make valid comparisons among airports and among some other entities impossible," wrote Mark Rosenker, acting chairman of the NTSB. Bird-watchers are not just eccentrics wearing funny hats. They are increasing in number faster than bald eagles and spend plenty of money. Wildlife officials aim to lure more birders to Central Iowa with a new bird trail map and posted signs at each location listed in the guide. "It's happening all over the country; we're now approaching 400 U.S. bird trails," said Doug Harr, Iowa Department of Natural Resource's wildlife diversity coordinator. "A number of these trails led to an economic boon, especially in rural areas." A source in the article says Iowa has more gulls than New Jersey. Truly? You can see The Makoke Trail, a 32-page PDF, here. Barton County, Kan., now offers two sites likely to attract more birders: Kansas Raptor Center at Great Bend Zoo and Kansas Wetlands Education Center. Zoo Director Mike Cargill said injured raptors that come to the center go through a step-by-step process. They are rehabilitated in the center's intensive care unit and then go to a critical care unit outside on the zoo grounds. After that, they will learn to fly while being carefully observed by inmates from the Larned Correctional Facility. The birds will be sent to "large fly pens" at the correctional facility, and inmates will track and record the raptors' movements, Cargill said. He said being able to use the inmates works well for the project because they can sit and observe the birds for hours at a time. Operated by Fort Hays State University, the wetlands center will open officially on April 24. It overlooks Cheyenne Bottoms, "the largest inland marsh in the United States and a Ramsar-designated Wetland of International Importance." I felt delighted to open Sunday's Times and see a bird -- an American Avocet -- on the front page of the California section. This birding article is the second within a month to get big play in the Times (the other one being the Travel section's piece about High Island, Texas). Nice to see birds, birding and birders like Jon Dunn receiving more coverage in a mainstream newspaper! Reporting from Lone Pine, Calif. -- Teams of biologists fanned out across the vast playa of Owens Lake on Saturday to take a full accounting of one of environmentalism's unintended successes: tens of thousands of migrating waterfowl and shorebirds roosting on a dust-control project. The 100-square-mile lake just east of Sequoia National Park was transformed into dusty salt flats after 1913, when its cargo of snowmelt and spring water was diverted into the Los Angeles Aqueduct. Since 2001, however, the Los Angeles Department of Water and Power has flooded portions of the lake bed to control choking dust pollution. Nature quickly responded to the ankle-deep sheet of water delivered by the $500-million dust-control project's plumbing system. First to appear on the sheen of water tinged bright green by algae were brine flies. Then came migrating birds that feed on them and peregrine falcons that feed on the birds. This year, Audubon California designated Owens Lake one of the 17 most important bird areas in the state and a globally important wetlands in the making. Nick at Biological Ramblings offers a carnival chock-full of species and birders. More than 35 bloggers contributed to the comprehensive review of recent birding posts, so grab a tasty beverage and settle into a comfy chair for a satisfying look at the hobby/sport/lifestyle of birding! For the 21st year, WildBird offers a photo contest with multiple categories and prizes. The entry form and new rules appear in the March/April and May/June issues. The postmark deadline for entries is May 15. * Only prints and digital files will be judged. Slides or transparencies are not eligible. The judges will not consider slides and transparencies. * Winning images may be used, without compensation, in advertising and marketing of WildBird, including free promotional items such as a calendar. * Participants can check a box to give permission for entries to be considered for Wandering Eye, the new gallery of readers' photos that appears in each issue. Once again, we have the pleasure of offering a Canon digital SLR as the grand prize. 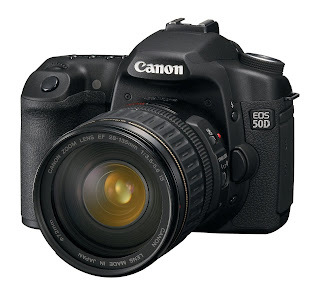 This year's grand-prize photographer will receive an EOS 50D (above). The five categories include amateur, sponsored by Kowa; backyard, sponsored by Droll Yankees; digiscoping, sponsored by Nikon; flight, sponsored by Minox; and water birds, sponsored by Leupold. Each category's sponsor offers prizes for first-, second- and third-place winners. In total, WildBird's contest provides 16 prizes. You can see all of them on page 47 of the May/June issue. Check it out today! A lawsuit recently filed in federal court accuses the Bureau of Land Management of violating two major environmental laws and its own regulations by allowing commercial activities to continue on those lands in California, Nevada, Idaho, Montana, Wyoming and Utah. But in a switch in strategy, the environmentalists aren't asking a judge to immediately halt those operations. They want to talk, and they think they may have a willing listener in the new Obama administration. "What we are after is finding a way to do things differently than in the past and better manage these public lands into the future," said Laird Lucas, a lawyer for the Western Watersheds Project, which filed the suit. Reward for details about Bald Eagle death in Tenn. The U.S. Fish & Wildlife Service and the Tennessee Wildlife Resources Agency are investigating the death of a bald eagle. The eagle was discovered along the shore of Lake Norris near Point 16 at the end of February, its carcass mutilated and parts removed. A reward of up to $2,500.00 is being offered for information which leads to a conviction of the person or persons responsible for the death of this eagle. Bald eagles are protected by the Bald and Golden Eagle Protection Act and the Migratory Bird Treaty Act, both federal wildlife statutes. Violations of these statutes carry maximum criminal penalties of up to $100,000 and/or one year in federal prison. Anyone with information concerning this eagle is asked to call Special Agent Ryan Noel with the U.S. Fish & Wildlife Service, Office of Law Enforcement in Knoxville, Tennessee at (865) 692-4024. You'd like to see your name in print in a national magazine? The first step involves crafting a query that piques and holds an editor's interest. How do you do that? Let me give one editor's perspective. 1. Look online for the magazine's submission guidelines, and follow them. If you flaunt the preferred procedures, you haven't shown attention to detail. 2. In the query, show that you're more than passingly familiar with the magazine, its audience and its coverage. Research impresses editors. 3. Set a professional tone, even if you have met the editor multiple times. Someone other than the editor you know might evaluate the queries. 4. Demonstrate your writing skills in the query. I'm not interested in published clips that have been edited; I'll use the query to evaluate writing skills. 5. Describe your story idea in detail, especially if the topic's appeared in the magazine within two years. How would your article differ? 6. Quickly explain why you deserve a byline and a paycheck. What value can you bring to the magazine that another writer can't offer? 7. If sending an e-mail, avoid "query" as the only word in the Subject line, and make your e-mail stand out. "Query: pack for a week-long birding festival with only a carry-on suitcase" definitely will help an editor remember you and your idea. More federal money for migratory birds? Birders have another chance to tell legislators about their passion for and concern about migratory birds. A timely, concise message can show that birders want their elected officials to support the Senate bill recently introduced by Sen. Ben Cardin (D-Md.) with cosponsors Sens. Mike Crapo (R-Idaho), Robert Menendez (D-N.J.), Patrick Leahy (D-Vt.), Bill Nelson (D-Fla.) and Joseph Lieberman (I-Conn.). Senate bill S.690 aims to reauthorize the current Neotropical Migratory Bird Conservation Act but with more funding. 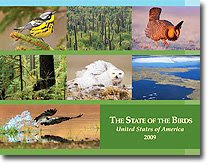 Recent reports -- such as "The State of the Birds" -- show declines in bird populations, hence the need for increased funding. The senators' hyperlinked names above allow birders to send messages to those officials. Check here for the snail-mail addresses, phone numbers and online contact forms for your state's senators. Want to write an article for a 2010 issue of WildBird? The time is drawing near when editors here will craft the editorial calendar for all of the 2010 issues. We will evaluate all the queries sent via e-mail (preferred) and snail mail (not preferred) in the preceding months and consider how the suggested topics might fit together in WildBird's six issues with 64 or 72 pages per issue. While considering the topics, I look at many other aspects of each query. For instance, does the writer address the letter to me rather than the generic Dear Editor? If not, the writer reveals a lack of research. Does that apparent laziness inspire my confidence in the quality of the writer's proposed article? Not so much. That criteria and others appear in Freelance Tips in the right column of this blog. To those writers who understand the freelance criteria, I extend a hearty invitation and a particular desire to read backyard-birding queries. 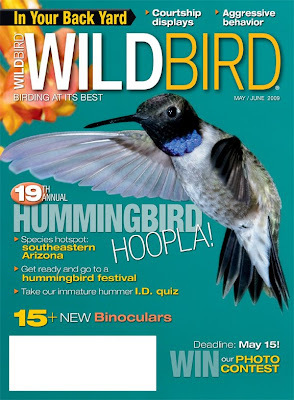 What topics can you suggest for the 20th annual hummingbird issue that haven't appeared in previous issues? Let's work together to create great issues! Have you birded at the Bolsa Chica Ecological Reserve wetlands? 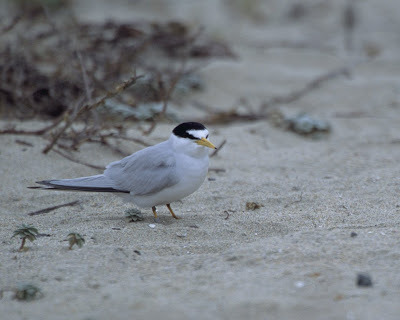 Enjoyed the nesting, endangered California Least Terns? Spied a Long-billed Curlew and, with joy, punched your birding companion (ahem, Mike)? A new book focuses on the wetlands' history, and a presentation later this month will give birders a chance to have the author, David Carlberg, sign his "Bolsa Chica: Its History from Prehistoric Times to the Present, and What Citizen Involvement and Perseverance Can Achieve." At Huntington Beach Public Library in rooms C & D, Carlberg -- who currently serves as president of Amigos de Bolsa Chica -- will give a presentation on April 30 between 7 and 9 p.m. His book "covers a millennia of natural and human forces that eventually shaped Bolsa Chica into the landscape we know today, from the indigenous people who inhabited it for over 6,000 years to the Europeans and Americans who owned it for another two hundred years." The book's also available for purchase here for $20. Any birders have $19.5M to buy land for birds? Perhaps you'd like to preserve some habitat for Southern California wildlife? Consider plunking down $19.5 million for 175 acres including Elizabeth Lake. Conservation Land Group is working with a realtor to sell "Los Angeles County’s largest privately-owned natural lake with surrounding wetlands, marsh and riparian forest providing habitat for over 138 wildlife species." Approximately 40 miles north of the Los Angeles Civic Center, the property might qualify for between $25 and $35 million in environmental credits, according to the realtor's press release. The land is also ideal for an Environmental Mitigation Bank due to the significant wetlands and numerous wildlife species found on the site. The property’s habitat includes more than 138 species, including Southwestern Pond Turtles, Tri-Colored Blackbirds, Southwestern Willow Flycatchers, Yellow-Breasted Chat, Yellow Warbler, Osprey, White Tailed Kite, and the Loggerhead Shrike. Some of the key features to the 175-acre site include two miles of shoreline, 16 acres of commercial land and 158 acres of wetlands and open water; all in a desert environment at the headwaters of the Santa Clara River. BIG SUR, Calif. - Three weeks after finding an adult male condor with 15 shotgun pellets lodged in its body, biologists at the Ventana Wildlife Society found three lead pellets in a juvenile female. The second bird, condor #375, was trapped by biologists on March 26 in Big Sur. The timing of the shooting is currently unknown. After conducting a routine blood test, Ventana Wildlife Society biologists learned that the second bird is suffering from lead poisoning. An investigation is under way, and the public is asked to contact law enforcement agencies listed below with any information on these shootings. X-rays of the ailing condor revealed three shotgun pellets embedded in its body - two in a wing and one in a thigh. Condor #375 was treated for lead poisoning and then immediately transferred to the Los Angeles Zoo for long-term treatment. “We were alarmed when one condor was found shot, but now with two birds in such a short time, we are deeply concerned,” said Kelly Sorenson, director of Ventana Wildlife Society. The wildlife agencies overseeing state and federal endangered species laws take any incident like this very seriously and will pursue justice for any criminal acts. Defenders of Wildlife is offering a $1,000 reward for information that leads to a conviction of those responsible for the condor shootings. Stiff state and federal penalties may be imposed for violations of the Endangered Species Act. Although both wounded condors are still alive, it remains unclear whether either would be able to return to the wild. The first bird found shot, condor #286, is still in critical condition with an incapacitated digestive tract due to lead poisoning. The condor remains alive only because veterinarians have been able to nourish him with a feeding tube. While the prognosis for condor #375 is better, one shotgun pellet has impacted a bone in the left wing, and it is unclear whether there will be long-term impairment of her ability to fly. In both birds, the lead exposure is more likely from a different incident involving the ingestion of lead fragments. Biologists have been working for decades to reestablish California condor populations in the wild. From a population low of just 22 condors in 1982, there are now 320 of these critically endangered birds in the world. Approximately half of all California condors are flying free in the wilds of California, Arizona, Utah and Baja Mexico. California condors can live to be over 50 years old but do not begin breeding until they reach a minimum of six years. Excessive mortality overwhelms the ability of long-lived, slow reproducers such as the condor. Even a low level of mortality is a serious threat to the population. 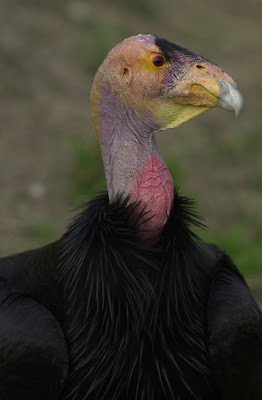 Due to lead’s toxic effect on condors, California changed hunting regulations in July 2008 to require hunters in the condor’s range to use only non-lead ammunition. Information on the new regulations can be found on DFG’s Web site. Pinnacles National Monument will be hosting a community forum in the coming month to discuss the California Condor Recovery effort. For more information, please call 831.389.4486 or go to the Web site. We opened up some beers and set to work. “Hmmmm…” Chas stroked his beard and scrolled through the submissions. “How about reproduction? It’s a driving force in every bird’s life after all. Who is we? Do birders really drink beer? Why is a coherent, new theme necessary? Could "Chas" truly refer to Charles Darwin? Answers -- and a fabulous carnival of 30+ post, well prepared by Great Auk -- at I and The Bird #97. Submissions for the next carnival are due before Tuesday, April 14, to Nick of Biological Ramblings.